The end of November marked the inception of Vitamin Creative Space’s “The Pavilion” – their third space in China, and second in Beijing. This occasion allowed for a revisiting of their presentation methods in their various spaces. So, what is this “Pavilion” and what purpose does it serve? And how does it relate to their previous space, “the shop”? Coming to grips with Vitamin’s selection of venues reveals a taste for poetic license in their consistently ambiguous commercial spaces. The shop, opened in November 2008, initially occupied a difficult-to-find commercial slot in the outer, less popular limits of Jianwai SOHO (part of Beijing’s CBD). 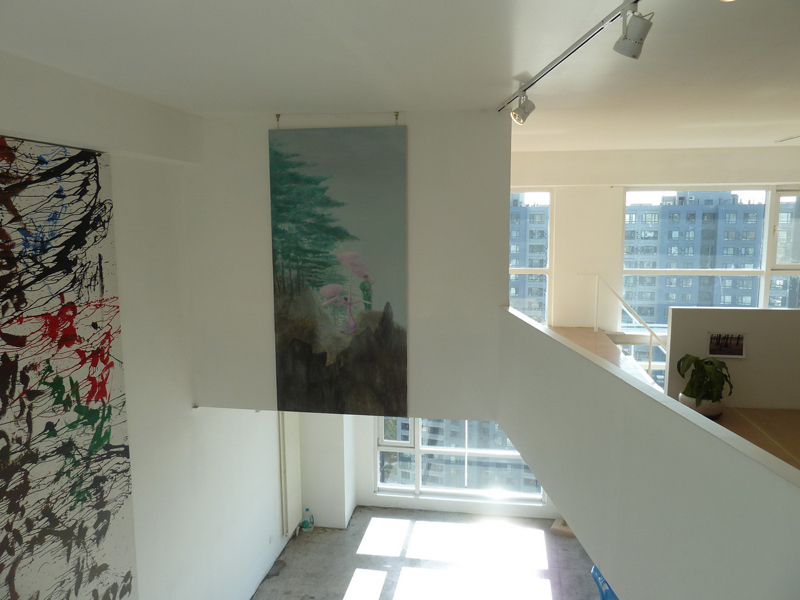 Earlier this year, it moved to a gated community of galleries in the maze-like art district of Caochangdi in Beijing. In this district-- not known for being user-friendly-- “the shop” took up position in a somewhat hidden space. And now, situated at the end of an anonymous corridor on the top floor of an office block, The Pavilion occupies an area that displays a similar aloofness. Visitors do not have an easy time finding the place. When I visited, there was no signage at any stage of the route up, just an open door. I think that one can now assume that making such an issue of access is a deliberate ploy by Vitamin. The Pavilion’s launch was preceded by an announcement laying some groundwork: “From the experience of the process of the shop … we feel the potential and necessity to explore a new approach to public space, leading to the emergence of ‘The Pavilion’.” Physically, this new approach reveals itself as a duplex, arranged to create various single and double-height spaces. The open-plan arrangement on both levels is dotted with artworks and installations. Two informal, semi-dedicated areas are labeled as “Facade Library” (currently a collection of books by and about Olafur Eliasson) and “Sound Archive” (displaying CDs and a laptop to listen to recordings). These two areas make use of the underside of a steep staircase that leads to the upper gallery space and then a small office area over the entrance, and doubles as seating for talks. While referencing traditional structures and borrowing some broad meanings from them, The Pavilion takes the example initiated by the shop several steps into overt poetry. As Vitamin’s director, Zhang Wei, remarked: “…unlike the shop that deals with the daily life issue, The Pavilion deals more with the issue of daily life awareness…”--an awareness that lets in a poetic reading of these spaces’ characteristics. This movement can be linked to the magical-realist texts of Hu Fang (artistic director of Vitamin), whose series of novels and stories seem to have formed a consistent influence on Vitamin’s activities and spaces. In the case of the shop, this movement continually attempts to pull the space back from a gallery-style aloofness, removing itself into an everyday-ness, re-energizing the gallery’s primary function as the space of commercial transactions. This retrograde movement is a somewhat quixotic position against its commercial landscape: in the process of emphasizing the quotidian, the activities reveal their poetic natures. The Pavilion carries on this movement, and perhaps forms a perfect binary with the shop. The Pavilion creates an imaginary reality in which to browse the artworks, while the shop presents a commercial reality in which imagination has become unhinged. On the one hand, The Pavilion is set up to transcend the gallery space, fictionalizing its activities while embedding the gallery’s functions in that very process. On the other, it transcends even this poetic reading by playing the fiction off against a commercial process that forms the very structures that make it possible. The space leaves plenty of room for the kind of aberrant activities we have seen at the shop, and it will be interesting to see how The Pavilion negotiates its relationship with the prior entity, as well as how its role as a Pavilion – but also a workable space – will evolve.